DVD players are quickly becoming standard appliances on college campuses as more and more instructors recognize the versatility of these machines. Unlike a DVD player designed for home entertainment use, the professional-quality DVD player is loaded with features that ensure that it will withstand frequent use and abuse. The teacher-friendly DVD-V7400 is Pioneer’s rugged workhorse for classrooms and lecture hall presentations. Compact and lightweight, it offers a variety of features that make it appropriate for campus use. The 10-lb. unit fits easily onto a small cart, leaving plenty of room for other appliances. All major functions can be accessed via a newly designed wireless remote or optional wired remote. Alternatively, the player’s PS2 port allows educators to navigate using a mouse and keyboard plugged directly into the front of the unit. Users can also connect the player to a computer for interactive multimedia presentations. The DVD-V7400’s video blackboard feature works as a highlighting tool. Users can type text, create drawings, or place graphics right on top of the video displayed on the monitor without permanently transferring the highlights to the disk. The player thus becomes an interactive blackboard for spontaneously demonstrating and pointing to specific concepts on the screen. Pioneer has loaded the player with barcode features designed to facilitate lecture hall use. The optional barcode reader enables teachers and students to scan preprinted barcodes from any print materials accompanying DVD-Video disks. Once scanned, the codes can be used to read images right off the disk. The barcode stack/command stack feature allows users to save video play lists for automatic recall and display. Using this feature, an instructor teaching several sections of the same course can store into memory each day’s presentation, saving class preparation time. It is even possible to set the player to play up to 24 different events in one week, all controlled through the weekly on/off timer. This feature makes it easy for an entire department to share one DVD player. Separately available Bar N’Coder Software allows instructors to create and print barcodes for any DVD disc, customizing the disc for individual needs. The DVD-V7400 plays multiple disc formats, including video CD, CD-DA, DVD-Video, and DVD Hybrid, and multiple disk media, including CD-R, CD-RW, and DVD-R. Other features included in the DVD-V7400 are playback memory (bookmarking function), scan, slow motion, on-screen menu, and chapter preview/digest. The player has component video output terminals, two composite video outputs, S-video connector, and RF output. A headphone jack with volume control is included as well. To ensure its tough reliability, the player features a brushless spindle motor combined with a heat and dust-resistant enclosure. Pioneer guarantees the player with a one-year warranty on parts and labor. It boasts a mean time between failures of 37,000 hours at a 100 percent duty cycle. 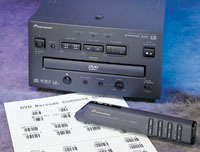 For more information on Pioneer’s DVD-V7400 player, visit www.pioneerelectronics.com. The basic technology behind the DVD player is essentially the same for every model, because every model is based on the DVD 1.0 standard specification. Every DVD player outputs audio and video to a television, computer, or audio device from a DVD disc, which looks like a compact disc. All players include basic features such as layer switching, subtitles, camera angles, the ability to read multiple languages, and parental controls. Beyond that, however, a multitude of features are available and vary from model to model, affecting cost and performance. Consumer-oriented models, on the lower end of the price scale, tend to offer fewer features and less robust performance. Education buyers who need a rugged machine that will withstand years of constant use should choose an industrial or professional-level player that offers high-performance, a good warranty, and features that make classroom use easy and convenient. Component video improves the image quality over S-video or composite video. Having ports in the front of the machine for mouse, keyboard, and other attachments simplifies set up for harried instructors or A/V staff. Barcode features are useful classroom tools for those using a DVD disc that comes with a manual or supplemental guide. Some DVD players can store and play on demand several discs (hundreds, even); with this feature, several instructors can share one player, load it with the necessary discs, and display the content as needed without having to restock the player for each person’s lecture.